Newsela is a service that makes it easy for teachers to assign nonfiction texts to students at appropriate reading levels. Quality and Effectiveness: Newsela delivers high-interest and timely articles at five different reading levels, many with associated quizzes. In addition, Newsela PRO allows students and teachers to annotate articles and create customizable writing prompts. Newsela is a great resource for struggling readers and also for ELL and ESL students to gain confidence and reading skills. As many articles are also available in Spanish, students and teachers can switch back and forth between the two languages. Each quiz is Common Core-aligned so teachers can focus in on specific skills where students are struggling. After a student has read and taken quizzes on eight articles, that student is assigned a reading level and articles are automatically delivered at the appropriate reading level for that student. The quizzes are designed so that students can practice both close reading and critical thinking skills. 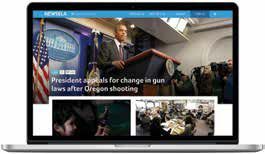 Ease of Use: Newsela is entirely Web-based, with an interface that is user-friendly for both teachers and students. Teachers can easily create accounts and classes, and Newsela generates a code for students to sign up. Students are not required to supply an email address to sign up, and if students lose their passwords teachers are able to reset them from the console. The help and support section is easy to navigate, with helpful screenshots and directions, and the features of the free and PRO options are clearly labeled. The Quick Start Guides for teachers and students are straightforward and easy to follow, and setup takes minutes. Creative Use of Technology: In addition to delivering new articles daily, Newsela provides an archive of articles teachers can search by topic and enables teachers to create text sets and sort articles by Common Core State Standards. With Newsela PRO, teachers are able to view student progress with easy-to-read and printable reports sorted by class, individual student, article, or Common Core State Standards. Newsela PRO also provides reports that administrators can view at school-and district-wide levels. Teachers can assign articles and text sets, and students can choose to read articles based on their own interests. Once a reading level is assigned, students can choose to challenge themselves by reading articles at a higher Lexile level. If they find themselves struggling, they can choose a lower reading level for each article. With Newsela PRO, articles can be annotated and students can write free responses, so they are practicing their writing skills as well. Teachers are then able to respond to both the annotations and the free responses. Suitability for Use in a School Environment: With over 1,000 articles in a variety of categories to choose from, teachers can easily find materials to complement their lessons—and students can find articles that are of interest to them. Newsela is a mustuse in the classroom. By providing high-interest articles at a variety of reading levels, Newsela encourages students to improve their reading and comprehension skills while also expanding their knowledge of the world. • Differentiation—Student reading levels are assessed and assigned based on quiz score results. • Customization—Makes it easy for teachers to find articles that are of interest to students and that tie into their curriculum, rather than using a prescribed set of unrelated informational texts. The ability to design free-response questions allows teachers to help students make connections between what they’re reading. • Powerful reporting—Allows students, teachers, and administrators to get a snapshot or in-depth view of student progress and achievement.